Six New Shows ... and other stuff! Six new shows are available on KalvoNet! Hear interview programs with N.N. und ähnliche Elemente and K&D's own David Gunn. We also celebrated Electroacoustic Music Week in November, fretted over political music, invented a new award, and last but not least played the marches, fanfares and dances of impeachment! These new shows join recent show postings of interviews with Mary Jane Leach (with new pix on her page), Steve Gryc (new pix on his page) and Michael Sahl (new commentary by Boudewijn Buckinx on his page), as well as our shows on choral music (a followup to Mary Jane's interview), on composer-rather-than-philosopher John Cage (he wrote great stuff! ), and some birthday folks. See a new pix of David Stevens and more info. The goddard.edu servers were inaccessible from Thursday, December 24, to Saturday, December 26. AT&T has solved the routing issue. We apologize for the inconvenience. The goddard.edu servers have been inaccessible since Thursday, December 24. AT&T is attempting to repair a major routing issue, and hopes to have it solved by Monday the 28th. We apologize for the inconvenience. If the server is down past Monday, we will temporarily move composer pages to this Malted/Media site and give you instructions on how to access them here. Audio files will remain unavailable until the goddard.edu servers come back on line. We're about to catch up on the site with new shows, scores, music and interview clips, and photos. We did manage to get some new photos up of N.N. und ähnliche Elemente. Our hard drive, down for 23 days (no thanks to Maxtor, who's had to replace it twice), is finally functioning again, so we're diving in to the work. But we are much in need of volunteers to do updates to our resources page. We have the material submitted, but sites need to be checked and inserted into the list. Please contact us. Attention WebTV users: WebTV and its owner Microsoft have decided not to support the latest versions of RealAudio. Please read this story, and then contact WebTV with your concerns. In the meantime, you can play our RealAudio files with any other online service. We are disappointed in WebTV's position, but cannot provide separate content for a single service provider. Five new shows are available on KalvoNet!. Hear interview programs with Mary Jane Leach, Steve Gryc and Michael Sahl, as well as our shows on choral music (a followup to Mary Jane's interview), on composer-rather-than-philosopher John Cage (he wrote great stuff! ), and some birthday folks. Read two brand new essays, Klarenz Barlow's 50 Jahre Avantgarde: Der Weg von Klangprägung zur Klingenden Münze, and Gary Barwin's Why There Should Be a Rock on Every Teacher's Desk. There are serious points buried in these wry pieces. These essays join three new essays on Tom Johnson's page: Narayana's Cows and Delayed Morphisms, a review of Self-Similar Melodies, and Automatic Music. Check out new pages for Bruce Hobson, Wendy Mae Chambers, and Michael Sahl -- all with musical excerpts, and interview clips with Michael. We also have new pages going up shortly for Louis Andriessen, Elizabeth Pizer, Jürgen Richter, Dietmar Hippler (whose interview is broadcast next week), and Anton Lukoszevieze. Check out the musical score examples of Michael Manion, beautifully crafted examples of contemporary scoring, in PDF format, to go along with the musical excerpts from Islands on his page. There are great new pix of the Brannen Kingma System flute on Anne La Berge's page, and amazing pix of Anne herself. Also, check out the cool new pix of David Dramm along with some more music, as well as the new list of recordings and complete catalog of Gwyneth Walker. After struggling with external searchers, we found one right here at home, courtesy of Goddard College. So search us! Our AmsterDramm Project was a great success, and there are now some photos of the evenings events for viewing -- and the whole 5-hour cybercast broken into manageable listening bits coming soon! But we are still some $3,500 short in our funding goal. Please click here to view the budget and help with funding this and future events. Many thanks! AmsterDramm Day was a huge success with a 5-hour cybercast. Read all about the live cybercast with David Dramm and Anne La Berge live from Amsterdam -- and many guests including Jacqueline Oskamp, Louis Andriessen, Philip Mechanicus, Ruth Dreier, Nick Didkovsky, Kevin Whitehead, Frances-Marie Uitti and Clarence Barlow, all from STEIM in cooperation with Vuurwerk Internet. Read two brand new essays, Klarenz Barlow's 50 Jahre Avantgarde: Der Weg von Klangprägung zur Klingenden Münze, and Gary Barwin's Why There Should Be a Rock on Every Teacher's Desk. There are serious points buried in these wry pieces. AmsterDramm Day is almost here! The special project planned for our September 12 show is almost ready -- a live interview via high-bandwidth Internet connection with David Dramm, along with a concert by David and Anne La Berge live from Amsterdam -- and many guest composer visits including Louis Andriessen, Richard Barrett, Clarence Barlow and others. Damian will be in the Vermont studios, with Kalvos in Amsterdam. Broadcast and cybercast of the concert from STEIM will be from both sides of the ocean in cooperation with Vuurwerk Internet. This special 3-1/2 hour show will begin at our regular time on Saturday, September 12 ... for more details, see our special AmsterDramm page and our ever-so-essentail funding page. If you're reading this on September 12 and want to get right to it, go right to the AmsterDramm cybercast! Two new and extended interview excerpts are posted with Christos Hatzis and Martin Arnold. New shows are up (and going up as this is being written). Check the shows page to see which links are just activated. Howard Jonathan Fredrics and Christos Hatzis are up, and the first part of Michael Sahl's show is going up now. These join recent shows with Canary Burton, Richard Tolenaar, and Michael Torke. AmsterDramm Day is Coming! A special project is planned for our September 12 show -- a live interview via high-bandwidth Internet connection with David Dramm, along with a concert, live from Amsterdam and many guest composer visits. Damian will be in the Vermont studios, with Kalvos in Amsterdam. Broadcasts and cybercasts will be from both locations in cooperation with Vuurwerk Internet. This special 3-1/2 hour show will begin at our regular time on Saturday, September 12 ... for more details, see our special AmsterDramm page. Three new essays are up on Tom Johnson's page: Narayana's Cows and Delayed Morphisms, a review of Self-Similar Melodies, and Automatic Music. New musical excerpts by Mary Jane Leach and Howard Jonathan Fredrics, plus extended interview clips with Michael Torke and Canary Burton. (By the way, Canary recounts here adventures on the K&D show here, that night's fireworks experience here, and reviews Dennis Báthory-Kitsz's Detritus of Mating in the Alternative Music Press. New pages for Bruce Hobson, Wendy Mae Chambers, and Michael Sahl -- all with musical excerpts, and interview clips with Michael. Recent musical excerpts posted are by Beth Anderson, Jon Appleton, Karlheinz Essl, Patrick Grant, David Jaffe, Tom Johnson, Jaron Lanier, Arthur Sauer, Phillip Silver, Michael Torke, and Daniel Weymouth. Also check back in next month for new musical excerpts by Michael Manion, Jacques Bailhé, and many others. We've got a diskful of new music waiting for conversion to RealAudio. Several composer pages are revamped. Check out the musical score examples of Michael Manion, and the extended interview clips with Michael Torke and Canary Burton, and a new page on Bruce Hobson. Other recent changes: Great new pix of the Brannen Kingma System flute on Anne La Berge's page, and amazing pix of Anne herself. Also, check out the cool new pix of David Dramm along with some more music, as well as the new list of recordings and complete catalog of Gwyneth Walker. There are new musical excerpts posted by Beth Anderson, Jon Appleton, Karlheinz Essl, Patrick Grant, David Jaffe, Tom Johnson, Jaron Lanier, Arthur Sauer, Phillip Silver, Michael Torke, and Daniel Weymouth. Also check back in next month for new musical excerpts by Michael Manion, Jacques Bailhé, and many others. We've got a diskful of new music waiting for conversion to RealAudio. Four more shows are available for listening! We're late with our playlist this week, but it's worth it! Now with a total of 142 shows available -- 300 hours of new music -- we have added the three latest with guests Richard Tolenaar (#164), Canary Burton (#163), and the second half of our interview with Michael Torke (#162), plus our show on The New Golden Age of Music (yes, that's now!). These are in addition to three recently archived shows on Vermont Composers (#78), Music of the 1980s (#77) and atonality (#60). Recently posted were shows with Arthur Sauer (#158 and #159), Bill Gilliam (#149 and #151), Martin Arnold (#152 and #153), Jon Appleton (#156), and archived shows with David Kraus (#39), and Mary Oliver (#57) -- as well as some "guest-less" shows on recent releases (#155 and #157), vocal music (#154), unique instruments (#81), dancelike music (#94), electronic music (#64 and #76), funny music (#63), New York composers (#88), and unusual combos (#101). Our latest shows are available here on K&D and also on AudioNet. Hildegurls: Including K&D guest Eve Beglarian. Coming to Lincoln Center; check it out. Our Music Resources have finally been updated. The Web is getting so big and sites so interesting that it's hard to keep up with what would be useful and interesting for composers. But we've got the latest updates -- 1000 sites in two dozen categories -- as well as our list of more than 500 composer sites. We're open to suggestions for new sites, and also cheerful and precise volunteers to help keep these pages updated. Amsterdramm Day Coming in September! A special project is being planned for our September 12 show -- a live interview via high-bandwidth Internet connection with David Dramm, along with a concert, live from Amsterdam. Damian will be in the Vermont studios, with Kalvos in Amsterdam. Broadcasts and cybercasts will be from both locations in cooperation with Vuurwerk Internet. This special 3-1/2 hour show will begin at our regular time on Saturday, September 12 ... details to follow! Seven more shows are available for listening! Now with a total of 138 shows available -- nearly 300 hours of new music -- we have added the three latest with guests Arthur Sauer (#158 and #159) and the first half of our interview with Michael Torke (#160), plus three archived shows on Vermont Composers (#78), Music of the 1980s (#77) and atonality (#60). Recently posted were shows with Bill Gilliam (#149 and #151), Martin Arnold (#152 and #153), Jon Appleton (#156), and archived shows with David Kraus (#39), and Mary Oliver (#57) -- as well as some "guest-less" shows on recent releases (#155 and #157), vocal music (#154), unique instruments (#81), dancelike music (#94), electronic music (#64 and #76), funny music (#63), New York composers (#88), and unusual combos (#101). Our latest shows are available here on K&D and also on AudioNet. Also coming up in the next few weeks are more new music (just posted: Islands excerpt on Michael Manion's page! 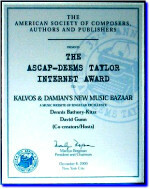 ), photos and writings recently received from K&D guest composers. Watch for the announcements! Another new essay is posted on the Bazaar, one by Damian himself! Read his collected essay/novella, The Wingback Tokamak [from to(roidal'naya) kam(era s) ak(sial'nym magnitnym polem)]. It joins several recent essays in the Bazaar by William Harris and Gary Barwin, as well as the (already) 157 show essays by Damian (David Gunn), as well as those by Jacques Bailhé, Dennis Báthory-Kitsz, Rhys Chatham, Matthew Fields, William Harris, Zeke Hecker, Laurie Spiegel, John Trubee, Gwyneth Walker, and Batya Weinbaum. Check them out! Several composer pages are revamped. Check out the cool new pix of David Dramm and Anne La Berge, as well as the new list of recordings and complete catalog of Gwyneth Walker. Check back in a few days for new musical excerpts by Michael Manion, Jacques Bailhé, Erik Nielsen, and many others. We've got a diskful of new music waiting for conversion to RealAudio -- as well as a new quarter-tone flute discussion page being set up by Anne La Berge. Twelve more shows are available for listening! We have the four latest with guests Bill Gilliam, Martin Arnold, and Jon Appleton, and four previous shows, with guests David Kraus and Mary Oliver and others on vocal music, unique instruments, dancelike music, electronic music, funny music, New York composers, and unusual combos. Our latest shows are available here on K&D and also on AudioNet. Also coming up in the next few weeks are new music, photos and writings recently received from K&D guest composers. Watch for the announcements! Four new essays are posted on the Bazaar, one by Bill Harris and three by Gary Barwin. Read Brain and Mind: A discussion of some of the modes of the thought processes by Bill and Defrosting Disney, Snow Princess and The Fabulous Brain (You Can Have Any Colour You Want -- As Long as It's Gray): Words for Young Composers About Musical Ideas by Gary. So have you looked at our list of essays? Not only are there more than 145 show essays by Damian (David Gunn), but there are also essays by Jacques Bailhé, Rhys Chatham, William Harris, Zeke Hecker, Laurie Spiegel, Gwyneth Walker, and Batya Weinbaum. Check them out! We need volunteers. As the web has grown, our original idea (begun in September of 1995) to keep up with new music resources and composer sites has become a huge job. We need some volunteers -- very accurate ones -- to verify our resources and composer site links and update the 50 separate pages ... see the master pages of Music Resources and Composer Resources. Our pages are created by hand for full accessibility, so we'll need typing accuracy as well as perseverance. If you're interested, please contact Kalvos, Contact Form. All our RealAudio is back up! Enjoy, and our thanks to Stu and Ravi for heroic byte-rustling over the past month, and to Goddard College for expanding our Internet pipe! Five new essays are posted on the Bazaar, three by Gary Barwin. Read Defrosting Disney, Snow Princess and The Fabulous Brain (You Can Have Any Colour You Want -- As Long as It's Gray): Words for Young Composers About Musical Ideas. The fourth one is by Dennis Báthory-Kitsz and is entitled Our Demented Therapeutic Culture, the fifth one an essay in hostile poetry by John Trubee called Please Refute This!, and the last is by Matthew Fields on the topic of Ancient Irrelevance. It looks like our cybercast of the upcoming SEAMUS Festival in April has fallen through. In case things change, we invite you to check this bulletin board for further information. We may yet confirm technical details. Four new essays are posted on the Bazaar, two by William Harris. Read Music and the Nine Deadly Perils and Music as Ambiance, Music as Mind. The third one is by Dennis Báthory-Kitsz and is entitled Our Demented Therapeutic Culture, and the fourth one an essay in hostile poetry by John Trubee called Please Refute This! So have you looked at our list of essays? Not only are there more than 145 show essays by Damian (David Gunn), but there are also essays by Jacques Bailhé, Dennis Báthory-Kitsz, Rhys Chatham, Zeke Hecker, Laurie Spiegel, Gwyneth Walker, Batya Weinbaum, and several more by William Harris. Check them out! We are moving our archive of shows from AudioNet. The lastest four shows will be posted each week on AudioNet, but the 98 previous shows will be moved to a new server to be announced in the next few weeks -- along with live weekly cybercast of Kalvos & Damian's New Music Bazaar. Our latest four shows include interviews with Robert H.P. Platz, Joseph Celli, and Stephen Parkinson. Our previous shows, which will return soon, include interviews with Jacques Bailhé, Clarence Barlow, Gary Barwin, Marc Battier, Olexandra Beck, Anita Beckmann, Eve Beglarian, David Behrman, Henning Berg, Peter Beyls, Gilles Yves Bonneau, Allison Cameron, Craig Bove, Joel Chadabe, Rhys Chatham, Nicolas Collins, Maria de Alvear, Jody Diamond, Nick Didkovsky, Arpad Elo, Matthew H. Fields, Stephen Gryc, Daron Hagen, Tom Hamilton, Jeff Harrington, William Harris, Zeke Hecker, Fred Ho, Don Jamison, Udo Kasemets, Rip Keller, Chris Koenigsberg, Johan van Kreij, Drew Krause, Anne La Berge, John Levin, Benedict Mason, Thomas Massella, Elma Miller, Keith Moore, Erik Nielsen, Pauline Oliveros, John Oswald, Sarah Peebles, Troy Peters, Larry Polansky, Eliane Radigue, Thomas L. Read, Kaija Saariaho, Phillip Silver, Linda Catlin Smith, Ann Southam, Laurie Spiegel, Rick St. Clair, Don Stewart, Carl Stone, Peter Tavalin, James Tenney, George Todd, Richard Tolenaar, Scott MX Turner, Peter Van Riper, Gwyneth Walker, Daniel Weymouth, a tribute to Conlon Nancarrow, and an original student opera. You wanted to know. Who knows why. But K&D have finally acceded to revealing their own desert island favorites -- and our list is updated! You can find out Kalvos's favorites or Damian's favorites. Oh yeah -- and here is a new picture of us! Coming soon! K&D live on the Internet! Watch this space so you can jack in every Saturday at 2:30 to 4:30 pm EST (1930 to 2130 GMT) to Kalvos & Damian's New Music Bazaar! Our latest shows have been posted on AudioNet, and their RealAudio 5 system is now working! Our latest eight shows include interviews with Laurie Spiegel, David Behrman, Matthew H. Fields, Tom Hamilton and Peter Van Riper. Upcoming postings will include Sarah Peebles, Phillip Silver, and Jeff Harrington. Watch for them! 80 shows previously available from our AudioNet jump page include interviews with Jacques Bailhé, Clarence Barlow, Gary Barwin, Marc Battier, Olexandra Beck, Anita Beckmann, Eve Beglarian, Henning Berg, Peter Beyls, Gilles Yves Bonneau, Allison Cameron, Craig Bove, Joel Chadabe, Rhys Chatham, Nicolas Collins, Maria de Alvear, Jody Diamond, Nick Didkovsky, Arpad Elo, Stephen Gryc, Daron Hagen, William Harris, Zeke Hecker, Fred Ho, Udo Kasemets, Rip Keller, Chris Koenigsberg, Johan van Kreij, Drew Krause, Anne La Berge, John Levin, Benedict Mason, Thomas Massella, Elma Miller, Keith Moore, Erik Nielsen, Pauline Oliveros, John Oswald, Larry Polansky, Eliane Radigue, Thomas L. Read, Kaija Saariaho, Linda Catlin Smith, Ann Southam, Rick St. Clair, Carl Stone, Peter Tavalin, James Tenney, George Todd, Richard Tolenaar, Scott MX Turner, Gwyneth Walker, Daniel Weymouth, a tribute to Conlon Nancarrow, and an original student opera.